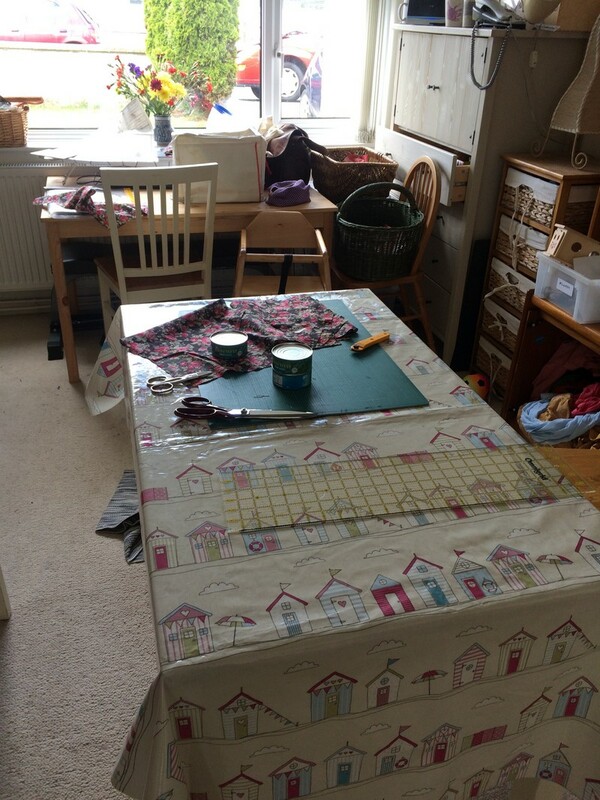 As you can see, my sewing table also has a weights bench tucked away underneath it, and the table surface and chair back often get used as a dumping ground as this is the first table you reach when you come in the front door. It’s next to the dining table, and that’s Gabriel’s high chair you can see there. I have to make sure if I’ve left any of my fabric over the back of my sewing chair that I tuck it right in so he can’t reach around and grab it with sticky fingers! Anyway, the small ironing board from IKEA (it was only £4!) turned out to be a stroke of genius as it’s a fine size for most of the pressing you need to do while sewing, and it saves me having to get the big ironing board out of the cupboard. Having it right there means I’m way more likely to be a good sewist and press seams as I sew, rather than winging it and hoping for the best (come on, we all do it from time to time!) I don’t leave the iron out all the time for obvious safety reasons, but when I’m doing sewing it’s the first thing I go and fetch. Well, maybe the second thing. The first is usually a cup of tea. Actually, how come there are no cups of tea in any of these photos?! You’ll just have to mentally add them in. Believe me, they’re usually there. Back to the sewing table… Next to the ironing board and behind my sewing machine are a selection of plastic wallets containing my current sewing projects. I might have everything I’m planning to sew that month out, or just the current and the next project, but there’s always at least two there. I collect the pattern, fabric, notions and anything else I might need together in a plastic wallet so I’m ready to go on the next thing as soon as I’ve finished something. This has been a real game changer for me and helped me up my productivity a huge amount. If you’re not already doing something similar, I recommend giving this a try and seeing if it helps you too. Andy cut into the table and made a shelf underneath to support my beloved Bernina, so I now have a huge flat sewing surface at the same level as the machine bed. This is wonderful for sewing large projects or anything with heavy, drapey fabric. It does make changing the bobbin thread a little bit more tricky, but I’m okay with that minor inconvenience. The table was one of IKEA’s cheapest offerings: £40 for Ingo in unfinished pine. It’s the kind of table you don’t feel too bad about potentially ruining! The plan has always been to paint it but that hasn’t happened yet, and to be honest, I doubt it ever will. At the moment the surface is covered in felt tip marks (thanks, kids!) and one of the table legs has been scratched to buggery (thanks, cats! ), so painting it would feel like polishing a turd. As you can see, the cupboard in the top houses my overlocker, some more plastic files with upcoming projects in them, and a basket full of random bits of material and scraps. 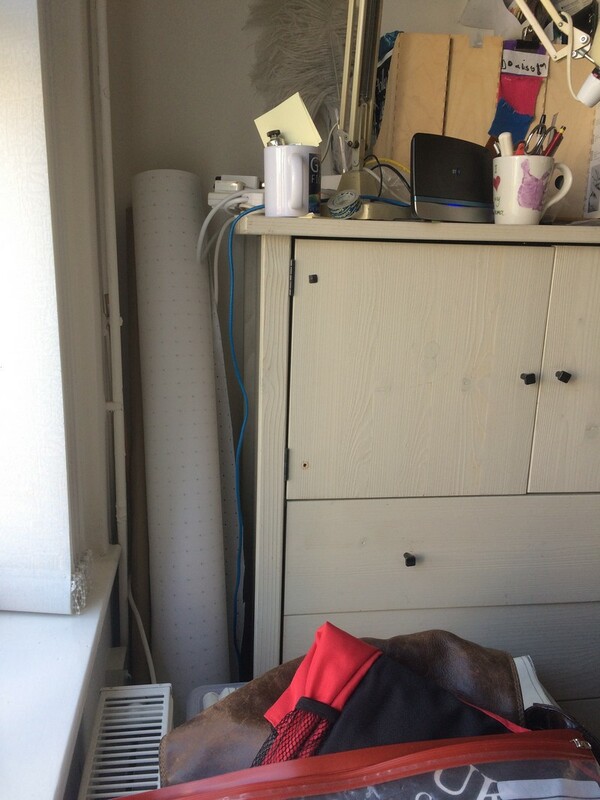 On top of the cupboard is mainly sewing related stuff, but I do have to share space with the router and the landline. The wooden files are all from IKEA (are you sensing a theme here?) and house things like patterns I’m planning to use this season, sewing machine manuals, interfacing sorted into labelled envelopes, and the like. Three of them are for other things: writing admin (I’m technically a novelist, although haven’t had much time for writing since having Gabriel), loose photographs that need sorting, and sentimental stuff like kids drawings (that one also needs sorting!). The paper on top is a pile of leftover bits of cross and dot paper that still look big enough to trace patterns onto. I also have three mugs on top of the cupboard: one for stationery items, one for my most used sewing tools, and one for marking/cutting out tools. Having them to hand helps me get set up really quickly when I find a minute to work on my sewing or sewing journal. The cupboard top is also home to a vintage 70s anglepoise lamp that my dad gave me. I love it, but it’s currently been confiscated by Andy as it had a dangerous wiring issue and needs fixing. That close up is to show you my roll of cross and dot pattern paper hidden away in the corner. I had to put it there as it’s incredibly heavy and I was worried about Gabriel injuring himself if he pulled it over. There’s no way he can get to that corner as I’ve filled the space between the table and cupboard with two large plastic storage bins (Samla from IKEA again, naturally). The bottom one houses my knitting and crochet projects, and the top is full of mending and alterations. I mostly try to ignore that one and hope it will empty of it’s own accord. So far that hasn’t been working, but I live in hope! The plastic storage bins and a chair are also there, blocking the drawers, to keep Gabriel from getting into them. I contemplated rigging up some kind of lock so he couldn’t access the sharp things drawer, but this was an easier and just as effective solution. It is a bit annoying when I want to get things out, but the top drawer houses the things I need most often, and that’s the easiest to get into if I move the chair (and cat baskets!) out of the way and tilt the plastic boxes. As you can see, I keep scissors, rotary cutters, pins and wonderclips, presser feet, bobbins, pattern transfer paper, and all manner of assorted haberdashery in there. It’s organised using shoebox tops and other small packaging boxes I’ve repurposed. The day-of-the-week pill boxes at the front are where I keep my packs of unused machine needles, sorted by type, and any needles that have been used (but still have some life in them) are stuck in my tomato pincushion. Those are all IKEA boxes in there! 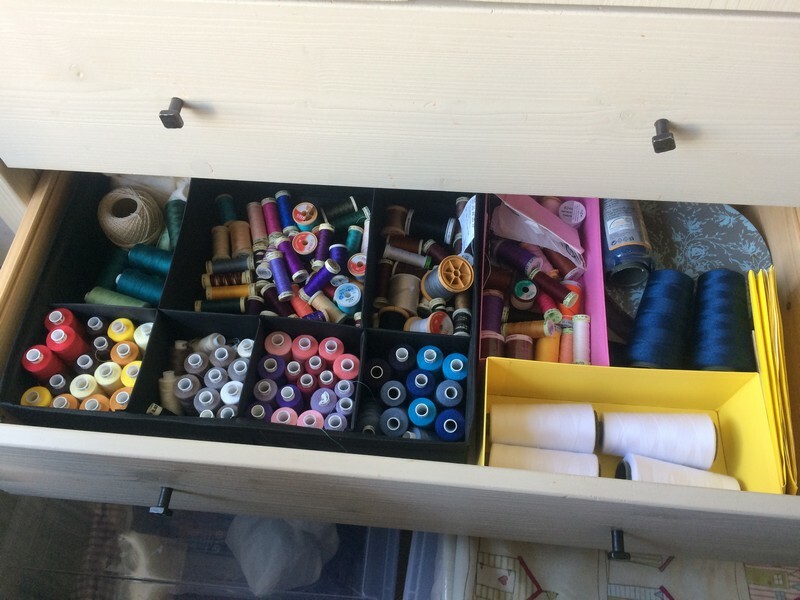 I bought the Tjena boxes on the right specifically for sewing storage (£1.25 each), but the main black organiser was stolen from my wardrobe, and is from the Skubb range (£6). I keep my overlocker threads organised by colour family, and my regular sewing thread at the back is divided by colours and neutrals. I also have a box for non-standard threads like quilting, buttonhole and topstitching threads (the pink box). The round box under the blue overlocker cones contains press studs and the pliers to install them. That’s a selection of Skubb boxes again, by the way! I love those things. The big one on the right is full of ribbons and lace, the next one is grosgrain and petersham ribbons, then we have elastic and bias binding behind, with the final one containing hook and loop tape. At the front lives a big bag of dried lavender and rose petals for making moth repellent sachets, and the rest of the space at the front is taken up with zips. 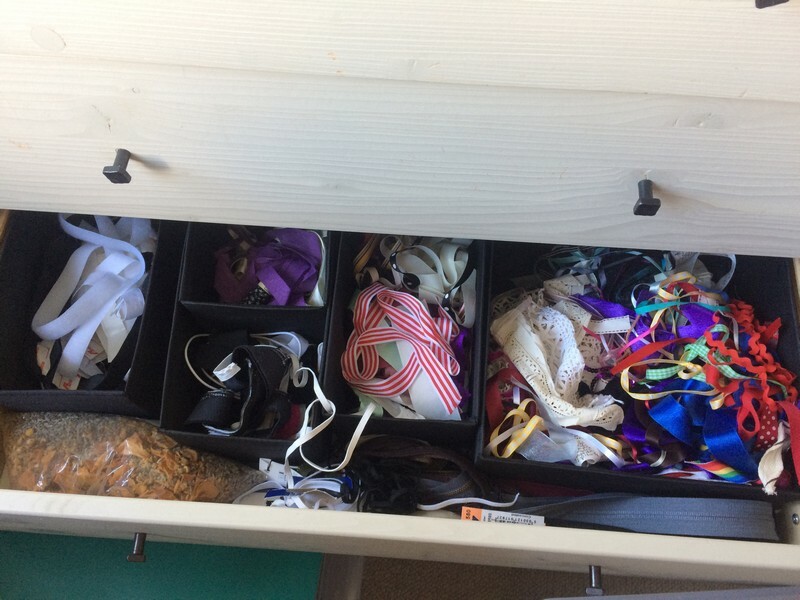 I haven’t included a pic of the bottom drawer as it’s full of lidded boxes (repurposed shirt boxes) containing lesser used things like felt scraps, curtain fixings, embroidery floss, corsetry hardware, etc. 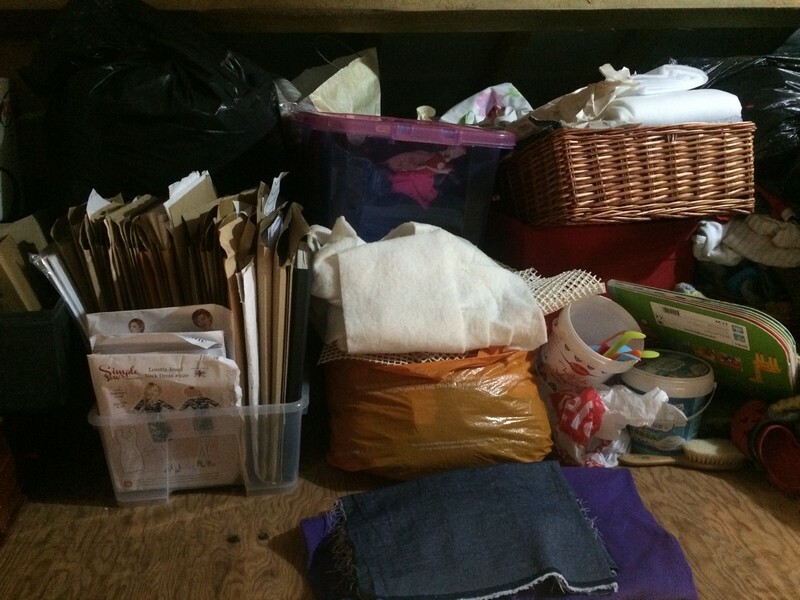 This is the fabric and pattern stash, up in the loft. There’s another layer of boxes behind what you can see. It’s far from ideal, which is why I like to plan out a month’s sewing and bring down all the fabric I need, so it’s easy to access. When I finally get my sewing room I want to bring all this stuff downstairs and organise it properly, but for now it is what it is, and I can’t see the point in trying to make it too pretty up there. So, that’s my sewing set up. There are things I really like about the current situation, like the ample natural light, the fact I’m in the main family room when sewing, and that my cutting out station is right next to the sewing table. But there are disadvantages too. I can’t leave it looking too messy as it’s right there, not only visible in our living room but visible to anyone who looks in our front window! I’ve minimised the hassle of setting up when I sew by keeping the most used tools and notions easy to access, but I’m really looking forward to having a dedicated sewing room (okay, it will be a guest bedroom too) where I can decorate to my taste and leave projects out so it’s easier to start sewing when I get a minute. I’m really looking forward to settling into my new sewing room when it’s finally ready–it’s a small, windowless room off the other end of the living area that’s currently Gabriel’s bedroom, but will have a sun tube fitted to give natural light (Gabriel will move into our bedroom and we’ll move into the converted garage room). I know I’ll have to furnish it on an extreme budget as the garage conversion costs are spiralling (complete lighting circuit rewiring required, we’ve just discovered), but at least I’ve learnt lots about budget sewing set ups while furnishing my current space. And most importantly, I’ve learned that I don’t need the perfect set up to be incredibly (by my standards!) productive and creative: it just takes a bit of careful planning and a few nifty storage solutions. Hello, IKEA! Anyone else struggling to find a space to sew? 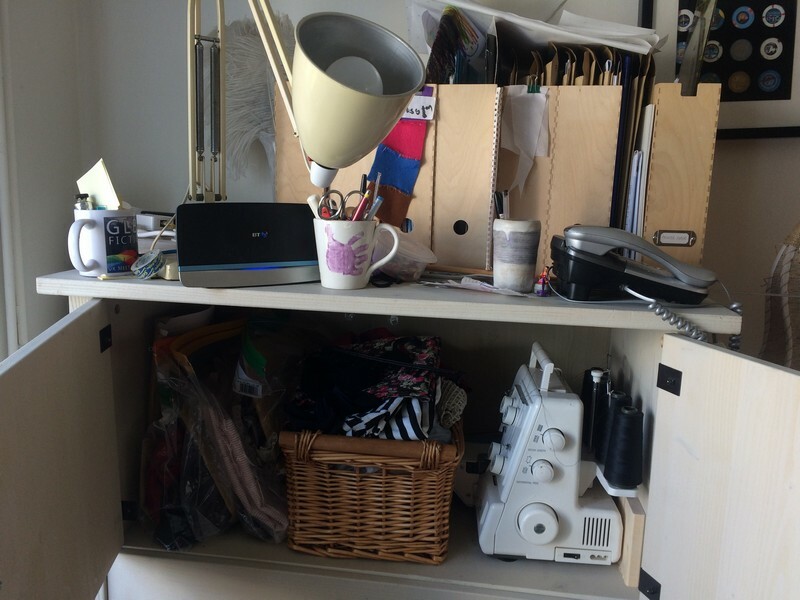 Or have you found other ways to make a sewing space on a budget? I’d love to see your solutions, so if you’ve blogged about it do share a link! 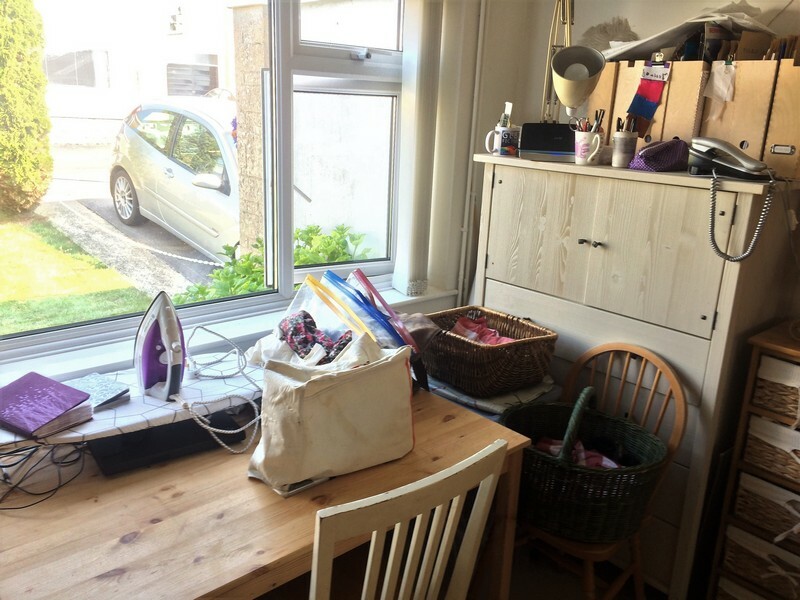 I really enjoyed reading this post about a real life sewing space – it made me smile. I used to sew at a worktop fixed at the end of a tiny box room in my little flat. I made many, many things despite constantly tripping over things on the floor, and banging my head numerous times on an cupboard door that I’d inadvertently left open. 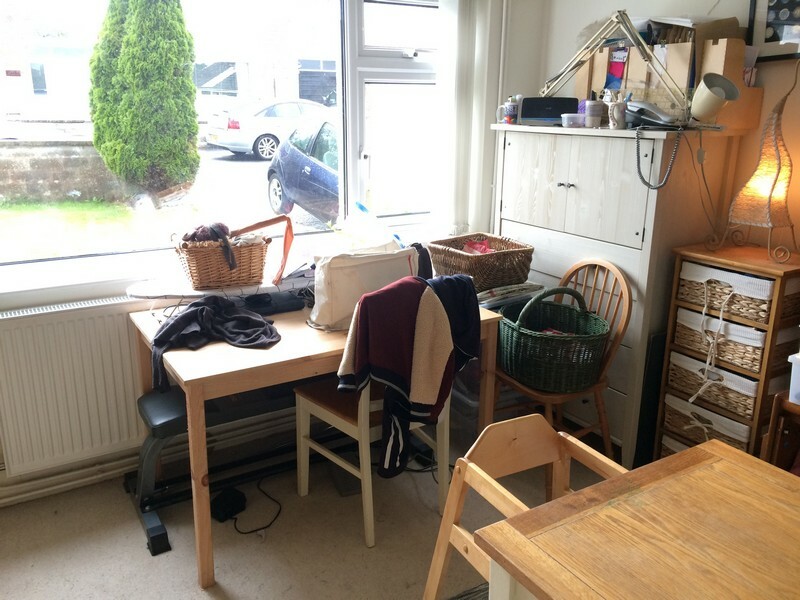 In September I moved to Norfolk, where you get much more property for your money and as a result I now have a lovely dedicated sewing room! I must admit, it IS lovely having room to move around – but I doubt that I’m any more productive than I was before. Sounds like you have everything beautifully organised, and long live IKEA, I say! Oh yes, back when I used to have a sewing room it was a tiny box room and I had similar issues. I reckon I’m more productive now than I was then! Norfolk is a beautiful county. Lucky you indeed! You have a lovely corner! 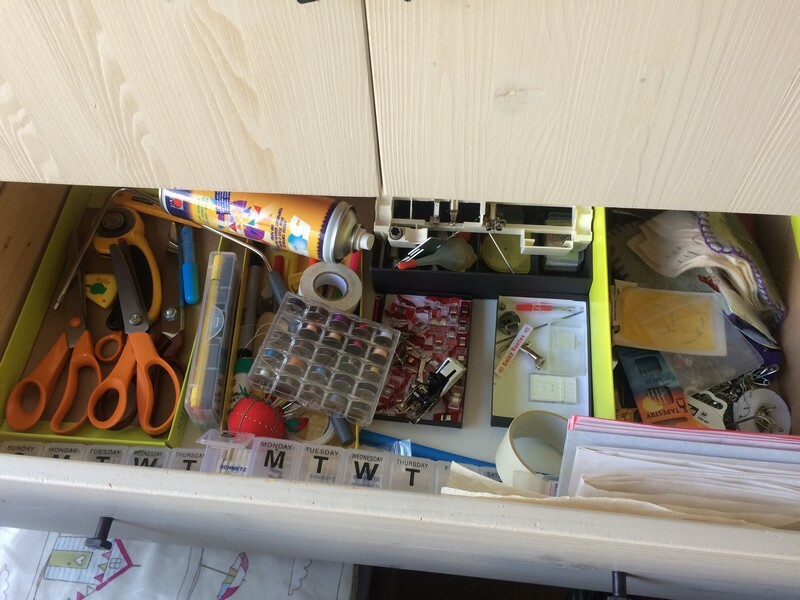 (I use a small sewing cabinet on wheels that I have to move from one side of the room to another!) 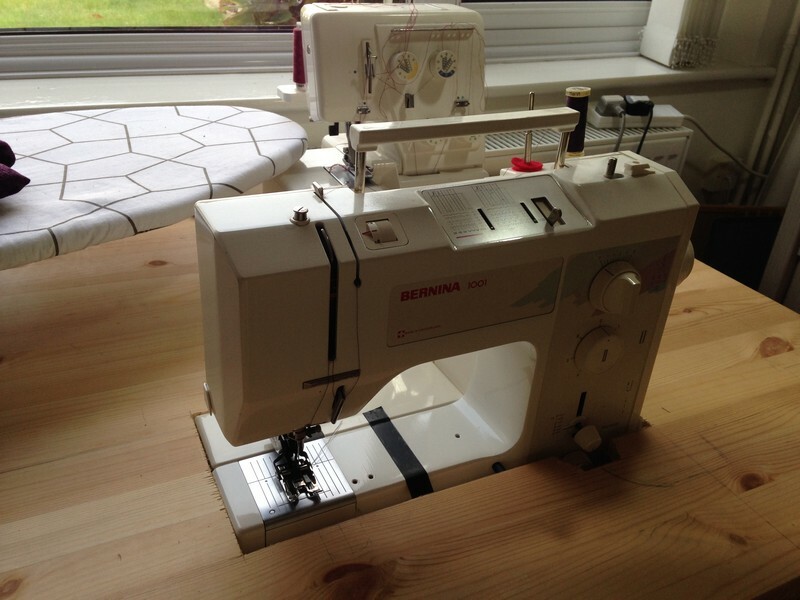 I like your sewing table with the cutout – good idea! Oh! I can’t imagine doing the cutout myself! You clever lady! Hehe, it was only a thought! Woodwork isn’t my strong point, but I can handle some simple stuff if there’s no one else to do it! 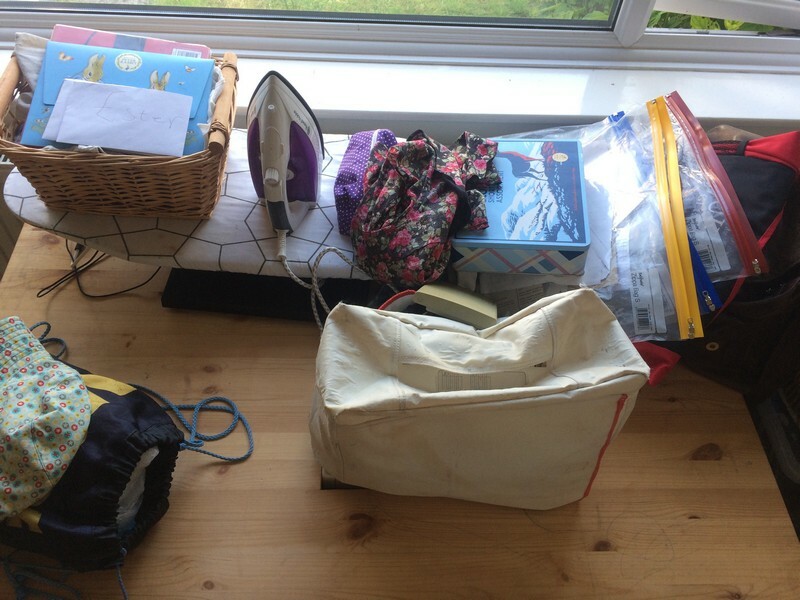 Yeah, I have decluttering to be getting on with… but sewing is more fun!